When it comes to conversations with my brother, they can be few and far between. We don’t have very much in common you see, and when he’s not bashing me for being a ‘student’ (FYI, left uni nearly 10 years ago now, pal) we’re often just bickering about mundane nonsense. One thing we can have an alright conversation about though, is food. A few months ago, he went to Rub Smokehouse in Birmingham and before his meal had ended he was sending me pictures of the food. Claiming it to be the best food discovery in Birmingham yet, I knew I’d have to go and sample the menu for myself ASAP. Tereza and I popped along the other weekend, on a usual jaunt in to Brum. We do struggle sometimes to find good places to eat, but over the last few months the standard has improved. I remember going to Birmingham around 2-3 years ago and being incredibly frustrated at the lack of independent places to eat. now we find ourselves a little more spoilt for choice. Rub Smokehouse is pretty much what you’d expect from the name. Classic American BBQ, alongside a few more quirky twists and turns on the menu. My burger of choice was the Kansas City Roll (£10.95). 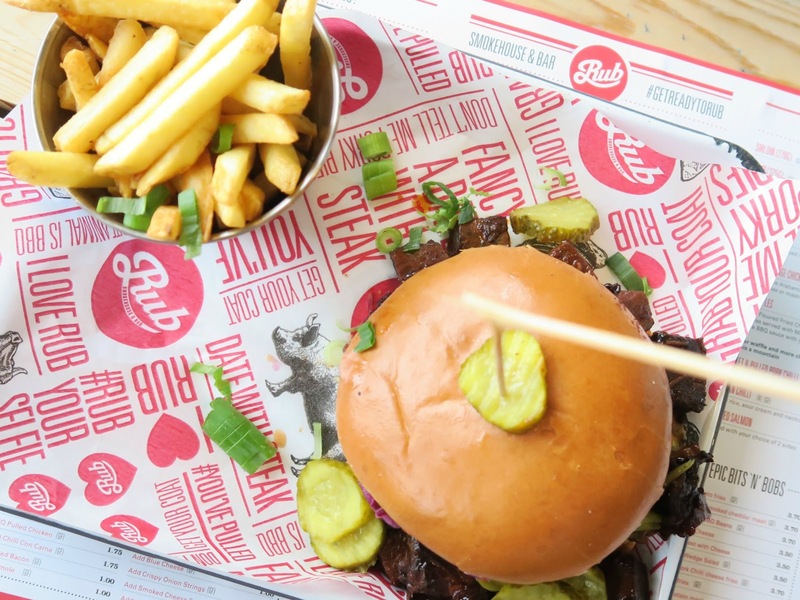 A soft brioche bun, which a generous helping of BBQ burnt ends within. Served with fries, it was just the right amount to refuel after a day of shopping. The burnt ends had a lovely texture, which changed with each mouthful. Crispy bits, with more chewy pieces of meat, the slightly sweet and sticky BBQ sauce was the perfect flavour for the meat. Whilst I wouldn’t place the menu and food in the same realm as somewhere like Almost Famous in Manchester, due to the price and variation in options, it was a refreshing change from the usual we go for in Birmingham. Rub Smokehouse is definitely worth a visit if you’re looking for a nice, dirty, American meal after a day of shopping and the cocktail menu is also worth a look. Browse the menu online here. Previous Post Beauty Blog: Is Primark Make Up Any Good? Next Post When Gandeys Thrill Circus Came to Town!